I love musicals too; really I do … There’s just something irresistible about Rogers & Hammerstein and many of their heirs that has been in my blood forever. Okay, I admit to having gone through brief periods of abstention from musicals, when I was too easily offended if someone opened her mouth in song and destroyed “the moment.” I mean, who does that? … But I’m older now. I like musicals. Still, my first choices usually run mostly in the low-key, truth-revealing little plays that ask me to join in exploring the quandaries of being a human being. 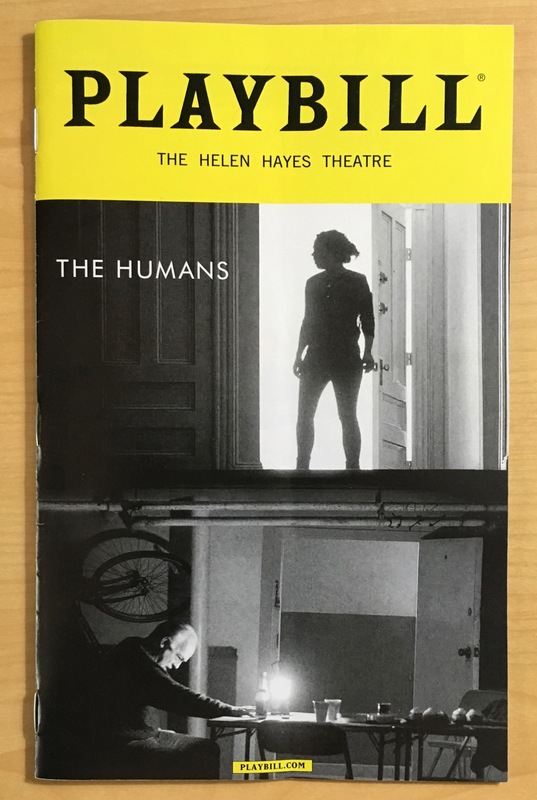 So when picking the agenda (and the budget) for my seven-plays-in-four-nights of New York theatre this spring, a play that was actually titled The Humans promised to tell me something about me and my species . And that was just too hard to resist, even before it earned all those kudos: rave reviews, a Pulitzer nomination, and “Best Play” awards by the Tonys, The NY Drama Critics, the Outer Critics Circle, the Drama League, the Drama Desk, etc. Pretty impressive! But what is The Humans, after all? A family is gathered together under protest for a bare-bones, paper plate Thanksgiving dinner at daughter’s bare basement level pad in Chinatown. On the surface, this appears to be “just another” holiday-family-reunion-kitchen-sink story, featuring a relatively unknown cast (except for Mom and Dad, played by old favorite Jane Houdyshell, and Reed Birney, both of whom have been around on- and off-Broadway and on film and TV long enough to feel like relatives). However, “just another…” doesn’t really apply here. Playwright Stephen Karam is no newcomer to the New York stage either. He also wrote Speech and Debate, and Sons of the Prophet (which earned him his first Pulitzer nomination). But he was himself surprised to find this play had made it to Broadway at all, never mind garnering so much praise along the way. Commissioned by the Roundabout Theatre folks, arguably the best nonprofit theater company in the country, it opened two years ago at Chicago’s American Theater Company, quickly moved just last Fall to their off-Broadway Laura Pels Theatre, and then immediately boosted up to the Helen Hayes on Broadway. As it turns out, The Humans is NOT about your typical dysfunctional family, where members aim sharply pointed clever lines at each other, rising to a climax where all the shams are exposed and everyone is destroyed and storms out of the room never to speak again. Or else somebody kills somebody. According to Karam, The Humans began with “What’s keeping me up at night?” Turns out to be just what’s keeping most of us up at night: Will I lose my job? Can I pay my rent? Will anyone figure out who I really am? Will my marriage survive? Am I an alcoholic? Am I losing my mind? Among the six person cast is Grandmother, lost to Alzheimer’s, and a family member for each of the above fears and then some. And what is such a delicious surprise is that the dysfunction actually works. Despite the fear and the hurt, the distrust and the disappointment, this family actually functions. Painful emotional outbursts are inflicted, absorbed, and remarkably, in a demonstration of human resilience, life goes on. We take what’s given to us, we feel the disappointment in ourselves and each other, and we go on in the hope that things will get better. And, just maybe, they will. The fear that they won’t, of course, never goes away. There are always the unexplained things that go bump in the night (which in this case occasionally scared the wits out of the audience). There is the constant unknown that we are lost in darkness, which is especially exploited at the end of the play, a curious throwback to the thriller/horror genre. Left alone after the Thanksgiving “feast,” during a full power outage, armed only with a lantern, Mr. Birney’s frightened character climbs into the dark at the top of the spiral staircase to seek the way out of his daughter’s seedy duplex. What kind of scary monster awaits him? A thug? A wild animal? A mad killer? Or worse: another day of struggling for his own and his family’s survival? The Humans itself goes on with defiant resilience. It was expected to close this month at the Helen Hayes Theatre. Instead, boosted by its four Tony Awards, it will turn around and reopen a block away at the Gerald Schoenfeld on August 9. The box office is selling tickets thru the end of the year. NEXT TIME: Blackbird, and then the last two of my spring splurges in New York: John Patrick Shanley’s autobiographical Prodigal Son, and finally, the pièce de résistance, the brilliant Lincoln Center production of The King and I. I told you. I have Rogers and Hammerstein in my blood. A recent trip accompanying my wife to Chicago afforded me the opportunity to see two brilliant productions in the windy city that this journal will also explore: The Goodman Theatre’s The Sign in Sidney Brustein’s Window, Lorraine Hansberry’s too-often overlooked second play; and up at the ever inventive Steppenwolf, Mary Page Marlowe, a brand new play by Tracy Letts (August: Osage County, Superior Donuts). We leave next week for the beautiful, welcoming little town of Niagara-on-the-Lake, in Ontario’s wine country. It has recently become a favorite vacation destination for both my wife and myself, a chance to get outside our borders and look back to see who we are in America. It’s a great place for fine wine and friendly conversation. And it also manages, without excessive commercialism, to host the annual Shaw Festival, the second largest repertory theatre company in North America. I’ll tell you all about it. So obviously there is much more coming. Be sure to sign up at the top right corner of this entry to receive notice whenever I make a new post. And PLEASE feel free to express opinions, arguments, and comments below. Select “Reply” and speak your piece. This entry was posted in Theatre and tagged 2016 Tony Awards, American Theater Company, Blackbird, Drama Desk Award, Drama League, Goodman Theatre, Helen Hayes Theatre, Jane Howdyshell, John Patrick Shanley, Lorraine Hansberry, NY Drama Critics Award, Outer Critics Circle Award, Prodigal Son, Reed Birney, Roundabout Theatre Company, Shaw Festival, Sons of the Prophet, Speech & Debate, Stephen Karam, Steppenwolf, The Humans, Tracy Letts. Bookmark the permalink. Hi Jay, Thanks for your thoughts. I remember you had similar issues with”August: Osage.” Certainly a valid point from one point of view. But leave a little room for the audience to do their own work, would you? All those “why”s exist to ask the questions, not to supply the answers. Easy answers would supply lies for the rest of us to hang ourselves on. Unanswered ones are what those that urge us to identify with the enigma of being human. What does it matter in the long run WHY I have a particular nightmare? The point is, I have nightmares. Because I’m human! Maybe it’s because my mother dropped me when I was a baby, or maybe my father ran away with the maid. Or maybe I don’t know and never will. All I need to deal with is that there’s a bump in my road I have to negotiate. And it helps to know there are bumps in the road for all my fellow humans, and we still manage to get around or through them without stopping to try to figure out how to flatten them all out. Looking back at all those deep plays where problems get “solved”? Are they really? In “The Glass Menagerie” the problems are not solved but there’s an understanding achieved, a resolution in terms that resonate. Tom knows he can’t be a substitute for his awol father. Amanda is unlikely to match Laura with a gentlemen caller. But with a better understanding of their frailties and illusions their lives just might go on with renewed strength. If Tom does fly away, then there is certainly hard work ahead for his mother and sister. Illusions can work for some but in the world of fiction the artist can perhaps turn to the creation of miracles. Note: It was here in St. Louis that Williams’ slightly older sister, Rose, began to cease to develop as a person and failed to cross over the barrier from childhood to adulthood. She, like Laura in The Glass Menagerie, began to live in her own world of glass ornaments. Eventually, she had to be placed in an institution. She became the model for Laura Wingfield. The description of Laura’s room, just across the alley from the Paradise Dance Club, is also a description of his sister’s room. Laura’s desire to lose herself from the world was a characteristic of his own sister. And both were seen by Williams as being shy, quiet, but lovely girls who were not able to cope with the modern world. I thoroughly enjoy reading your reviews and look forward to many more. Next time you plan to be in Chicago, give me a holler. I’d love to see you – even if it is just for breakfast or a snack in between theatrical experiences. Enjoy your holiday in Ontario! Stephen Karam adapted Chekhov’s The Cherry Orchard for Broadway, which has a multi-racial cast and three stars. He updated the language some but the story is the same. I adored the production for its refreshing presentation of a classic. The set design was unusual with Calder like mobiles standing in for cherry trees. Joel Grey is delightful as the dedicated servant. Diane Lane plays a stunning woman who could be easily forgiven for all her flaws. John Glover as her brother is hilarious. In fact, all the players are terrific and I thoroughly enjoyed my evening at the theater.